World Vision is an international aid Christian humanitarian organization that works in nearly 100 countries around the globe, combating the root causes of poverty and responding quickly when disaster strikes. They partner with communities to find lasting ways of improving the lives of children and their families while providing international disaster relief. Recently, I have received two catalogs in the mail that showcase very affordable ways to support World Vision. And quite honestly, I probably would have never found this organization had I not received those catalogs. Just goes to show you what marketing can do! The kids and I paged through the catalog earlier today. I told them all about poverty in other countries ... it helped to be able to show them the pictures in the catalog as a point of reference for their little heads. I told them that we were going to help one family by purchasing an animal for them ... and I wanted them to pick which animal we would buy. So they did ... and they picked a chicken. 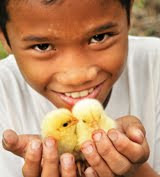 Your gift of a chicken will provide a family with a lasting source of nutrition and income. Fresh eggs raise the levels of protein and other nutrients in a family’s diet, and the sale of extra eggs provides money for other household needs. How cool is that ... all for just $13! Wow - what a cool thing.